ENVIROLINK™ – Mountain Power, Inc.
Environmentally safe, technologically advanced, sealed power. All characteristics of one battery. 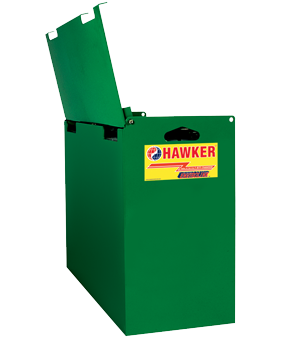 The ENVIROLINK™ valve-regulated lead-acid (VRLA) battery by HAWKER. Environmentally Safe - Leakproof/spillproof/safe. Since the ENVIROLINK™ battery is sealed, there is never a need to worry about acid spills. 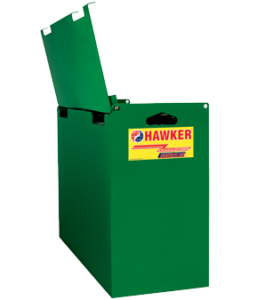 ENVIROLINK™ is also safer for employees due to no excessive gassing during the charge cycle. No Watering - Since the ENVIROLINK™ battery is a sealed battery, no water will ever need to be added, not for the lifetime of the battery. No watering. No room for over/underwatering error. Reduced Expenses - The ENVIROLINK™ battery never needs to be watered, so watering costs are eliminated. ENVIROLINK™ also emits almost no hydrogen, thereby eliminating the need for special ventilation. ENVIROLINK™ allows you to charge at the point of use. Light duty is up to 60% discharge over an 8-hour shift at an ambient temperature of 86°F or less. Medium duty is up to 80% discharge over an 8-hour shift at an ambient temperature of 86°F or less. Heavy duty is more than 8 hours of discharge in a 24-hour period, or operation at an ambient temperature of greater than 100°F. For any use other than Light and Medium duty applications prior approval must be granted. If your application meets ALL of the following requirements, ENVIROLINK™ (VRLA) batteries are a suitable choice for your application. Your equipment is designed with a lift lock-out or other device that should be set to take the truck out of service when the battery reaches 1.90 VPC under load. The charger has a HAWKER-approved profile for gel batteries. Charge time for an 80% DoD battery is 9-16 hours based on charger type. Battery will not be discharged to more than 80% DoD in 8 hours at any time. Battery will not exceed more than 8 hours of discharge use before being charged. Battery will not exceed more than 2 calendar days between charges. Battery must be equalize charged once weekly for 7 hours at 1.5% to 2% of the battery capacity. Battery must not be charged if battery temperature is over 90°F. Battery must first be cooled to below 90°F before charging. The maximum number of cycles per day is 1 (one discharge and one full recharge). The battery will not exceed a maximum of 250 cycles per year. The temperature range of use for the battery is between 60°F and 100°F as measured by the Battery Boss or Battery Boss WC battery control module. Any use outside this range must be approved by HAWKER. ENVIROLINK™ (VRLA) batteries are the perfect environmental choice for your operation if your application criteria matches those of the VRLA product.